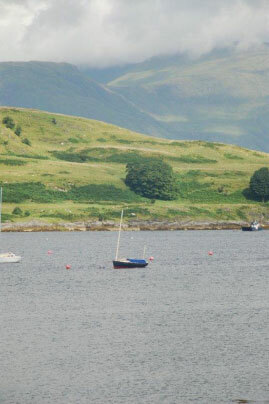 Two men and their small boat ‘Corriemhor’, take their first sail together from Helensburgh to Loch Linnhe, written in ‘thank you’ to the www.roxanne-romilly.com webmaster for his help facilitating the initial contacts between prospective buyers and seller. Having bought Corriemhor (Sail no 9) seen only sitting on the previous owner’s driveway, this was the day we were to learn how she is rigged and comes together as a boat for the first time. 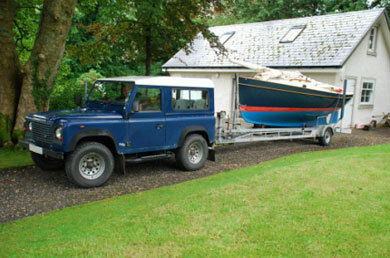 But before that, the nerve-wracking drive to Rhu Marina where the boat was to be lifted-in. It wasn’t very far, but it’s amazing how big a small boat looks on the road, so we were glad for the no-nonsense capability of a Landover to get us there. Even more daunting than the launch, was the driver’s mission to deliver the trailer and tow vehicle to the berth at Loch Linnhe, and then to travel back by public transport in time for the local pub’s dinner service closing time. The trailer looks big when full of boat, but positively enormous, even when empty on narrow Scottish country roads, with busses bearing down and a queue of traffic building-up behind. That was tough on the nerves for a few hours, but the bus services worked well, and thanks to the offer of a lift from the previous owner’s wife for the final few miles of the return journey, the appointment with the pub was comfortably met. Whilst the driver was wending his way northward with the trailer, the other of our intrepid crew stowed the gear and erected that great blessing of an optional extra – the cockpit tent. For anyone contemplating the purchase of a Romilly, this is one extra this crew would thoroughly recommend. It simply transforms the accommodation. It justifies completely the designer’s decision to trade-off a small cuddy with a large cockpit for elegant lines and optimal day sailing, yet providing spacious accommodation and good headroom when camping. Thursday was our fist ever sail, so we were pleased that it dawned such a fine day, although as it would turn out, with little wind. Manoeuvring in the marina exposed one of the Romilly’s handling characteristics that is probably a blessing at sea, but inconvenient in a tight space; her long turning circle – especially going astern. Something this crew will be trying to avoid doing too much of. Once clear of the marina we were keen to try her sailing ability without the drag of the prop through the water, which means lifting out the motor and replacing it with the fairing plug. Sure, lugging a motor around the cockpit of a small boat requires some effort and the risk of the odd bruise, but it appeals to the purist in everyone to know that the vessels lines are now as clean as the designer could have wished for and that one is now experiencing sailing at its most basic. We found the removable plug to be an elegant compromise between the necessity of an engine and the opportunity for simply sailing. With the motor stowed, and the plug fairing the hull we made a leisurely sail through the spectacular Kyles of Bute, where the occasional close proximity to other yachts invariably yielded complements to the boat. A real tribute to the designer’s art, and to the previous owners for keeping her in fine condition, despite her being a reasonably early model from Dartington Boatworks. 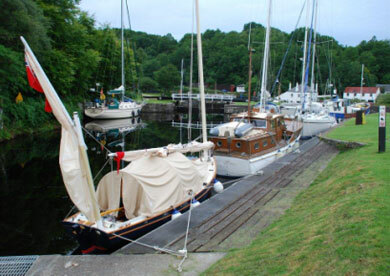 When we arrived at Ardrishaig, the canal was closed and the visitors pontoon occupied by boats much larger than ours, so we moored at an apparently seldom-used buoy for the night, somewhat apprehensive in case some irate fisherman should arrive in the middle of the night demanding it back. Once again, the cockpit tent proved its worth, but this time the detail that caught the eye was the prismatic skylights that admit a diffuse glow of light to the cuddy. No doubt those fittings are costly, but they sit well with the philosophy of the boat, and they are a joy to behold. Friday dawned a belter, and after a shower at the British Waterways facilities at the sea lock, we locked-in for the crossing of the Mull of Kintyre. Throughout the transit we found BWB staff to be friendly and helpful, but the first lock-in was pretty intimidating as we had to share the lock with a number of large yachts, and our mizzen had a close encounter with the fangs of a bow-mounted anchor on a boat behind us. After a couple of locks we decided to stop for fuel, and that delay put us behind the other boats that so we were left to enjoy the rest of the transit alone. That was great in terms of removing some risk of damage to the boat, but it meant our intrepid crew had to work pretty hard operating the locks alone. So it was a pleasant relief when our passage through a lock coincided with that of a boat coming the other way, so that at least some of the work could be shared. A really enjoyable day was topped-off with a great meal and pint at the Crinnan Hotel and the complements of a passing boat builder who was interested to know something more about the Romilly’s design and our thoughts as to how the design worked. 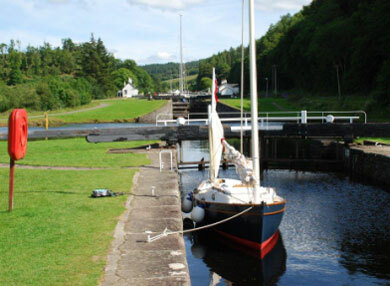 Our final day really started once we had exited the final locks at Crinnan, where we picked up a buoy just outside the canal whilst we stowed the motor and made ready. We sailed off the mooring by backing the mainsail and were quickly under way, although we were in no particular hurry, as a tidal gate at Craignish Point wasn’t yet ‘open’. Our journey thus far had been pretty unremarkable in terms of tides, but our passage through the sound of Cuan was to change all that. We transited the sound at mid-flood, and whilst we were doing 3 knots through the water as we entered the sound, we were soon doing 8.5 knots over the ground, winding our way through huge boils of water emerging from the depths. For someone unused to such tides it came as something of a surprise to literally see the sea flowing ‘downhill’ with one’s own eyes, and to imagine with some trepidation what the nearby Corrievreckan must be like at full flood. With the sound of Cuan successfully navigated, we had a pleasant sail past Oban, before it started to rain, so the final few miles of navigation were made slightly more intensive given the relatively narrow channel behind Shuna island that we were aiming for. We arrived in time for a fantastic meal at the Ferry Inn at Port Appin, and a quite night on a pontoon before stowing everything and leaving the following morning. That was one of the most enjoyable few days anyone could wish for. 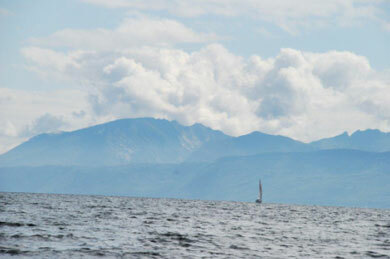 Enjoyable sailing in a beautiful and well thought-out boat that fits exactly what the owners want. Take that, and place it on the beautiful west coast of Scotland, add some tidal and navigational challenges, some tremendous meals and hospitality, and you couldn’t find two people more satisfied with their lot. Here’s hoping for many more such adventures.